Automated Insights’ AP earnings reports: “Robot journalists” a misnomer? Automated journalism is no longer science fiction. It’s time to change what we call it. I followed a link and read an earnings story about the NYT ... written by a robot. http://t.co/zgWXMVxYRf Gee. The robo-reports look a lot like the human-written earnings briefs that the AP and other news wires have been publishing for years, if perhaps a tad drier. They’re now generated almost instantaneously by software provided by a Durham, North Carolina-based startup called Automated Insights, which also provides automated fantasy football recaps for Yahoo and automated car descriptions for Edmunds. The AP announced its deal with Automated Insights last summer, at which time I wrote about it at length. As Poynter notes, the move has allowed the AP to cover 10 times more companies’ earnings than it did before. If I were a “robot” journalist, I would deftly fill the rest of this post with updated facts and numbers describing the scope and pace of robo-journalism. Instead, my quixotic human brain has led me to focus on a question of semantics: Are the computer programs that are writing the AP’s news stories really robots? And if not, why do even the most careful of writers keep calling them that? There was a pause on the line, as if Allen were expecting me to reassure him on this point. I, after all, am among the many writers who have cheerfully deployed the term robot in headlines describing products like his. And, yes, I too have illustrated said posts with cheesy stock images of what look like shock troopers seated at computer keyboards. Of course, I wanted to reassure him. Everyone knows we’re talking about lines of code here, and not a fleet of journalistically inclined Terminators. There is something intrinsically amusing about the word robot, and still more so about the idea of a Rosie Jetson-type character pulling up a chair in a newsroom and hopping on a corporate earnings call, pen and notebook at the ready. Very soon, though, the novelty of automated journalism is going to wear off. And when it does, I suspect we’ll realize that robot was the wrong term for it all along. Today, the Oxford English Dictionary defines robot as “a machine capable of carrying out a complex series of actions automatically, especially one programmable by a computer.” At first glance this would appear a broad enough definition to include journalism software—and all kinds of other software, for that matter. That is, until you notice that the OED further defines machine as, in part, “an apparatus using or applying mechanical power.” For a human, writing a news story might incidentally involve the application of some mechanical power, but not for Automated Insights’ software. Reference books can’t tell us everything, however, especially when it comes to terms that describe fast-evolving technologies. So I went out and asked some prominent figures in modern robotics for their own definitions of robot, and whether it encompassed newswriting programs. Their definitions differed slightly, but on the second point they were unanimous. “I don’t think those are robots,” said Chris Anderson, co-founder and CEO of 3D Robotics and former editor-in-chief of Wired. A robot, he said, can sense the world around it. It possesses some form of intelligence, however rudimentary. And it can act on the world around it. So toasters and dishwashers aren’t robots, because their operations are limited to what transpires within their own confines. Autonomous drones and self-driving cars are robots. But newswriting software is not, because it neither directly senses nor acts upon the world around it. Asked what he would call the programs that write earnings reports and the like, Anderson suggested bots. The word derives from robot but has come to mean something different: Per Wikipedia, it’s “a software application that runs automated tasks over the Internet.” That sounds more like it. It’s hard to argue with the accuracy of software agent, but it isn’t the catchiest term. To this human journalist’s ear, bot looks more like headline material. But the people who build the software in question aren’t convinced that’s quite right, either. 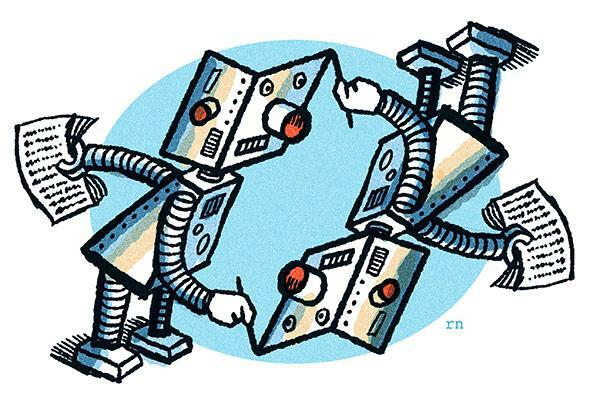 “To me, bot puts the emphasis slightly in the wrong space,” said Kris Hammond, chief scientist at Narrative Science and a professor of computer science and journalism at Northwestern University. It’s better than robot, he added quickly. But it still reflects an impulse to reify or personify what is really a technological process, not an individual agent. “If we were writing baseball stories and that’s all we did, I would say, ‘Sure.’ That’s actually a fine domain for personification,” Hammond said. Narrative Science first made its name with software that turned box scores and play-by-play data into narrative recaps of college baseball games. But the company has more recently branched out into a wide array of business-intelligence applications, such as analyzing stock portfolios and generating reports on why they have or have not been performing well. The key to this type of software, Hammond said, is that its workings must be comprehensible to the humans who use it. Bot, to him, implies a sort of technological black box that could go rogue without warning. I sighed. It was almost as if these robotics experts were more concerned with accuracy than with getting bored Facebook users to click on their stories, as we online journalists have been programmed—er, well-trained—to do. I think both he and Hammond are onto something. All the hoopla about “robots stealing our jobs” has led people to assume that if some new technology performs a task traditionally performed by humans, it must be a robot. But the term carries a lot of pop-cultural baggage that risks clouding our understanding of what we’re really talking about when we talk about automation. The roboti of our imagination are bumbling today, but could turn deadly tomorrow. They’re cute yet alien, endearing yet inscrutable. They have minds and bodies of their own, and maybe lasers too. The sort of automation that is actually revolutionizing the economy has little to do with Rosie Jetson, the Roomba, or Boston Dynamics’ Big Dog. It’s about software, not hardware. And when it works, it tends to quietly ingratiate itself into our everyday lives, rather than rising up in armed rebellion. If newswriting software is a robot, then so are Facebook’s news feed, Netflix’s recommendation algorithm, and Pandora. By that definition, too, it’s time to retire the term robot when we talk about the sort of software that automates the transformation of spreadsheets into prose. It’s clear from the AP earnings reports that it is already working. In the long run, newswriting software may or may not usurp reporters’ jobs. (I’ve argued before that it probably won’t anytime soon—not the parts of their jobs worth preserving, anyway.) The Associated Press says it has not in fact replaced any of its editorial staff with Automated Insights’ software so far. It has just altered their roles to focus more on the sort of creative journalistic work that software can’t yet perform. But when and if automation does reshape the news business, as it has reshaped and displaced human labor in so many other fields, thinking of it in terms of robots will leave us ill-prepared to recognize the change. We’ll be waiting for something to roll into the office one day, take our seat, and start typing on our keyboard. And we won’t notice the 50 desks that have already been vacated without any visible sign of a replacement.